 5 Fandom Friday: Favourite fandom accessories that I own. Woo-hoo! Finally a fashion-related 5 Fandom Friday. I am a total nut for fandom accessories so It’s going to be very tricky indeed to choose just a couple of things from my collection to highlight. Here we go! 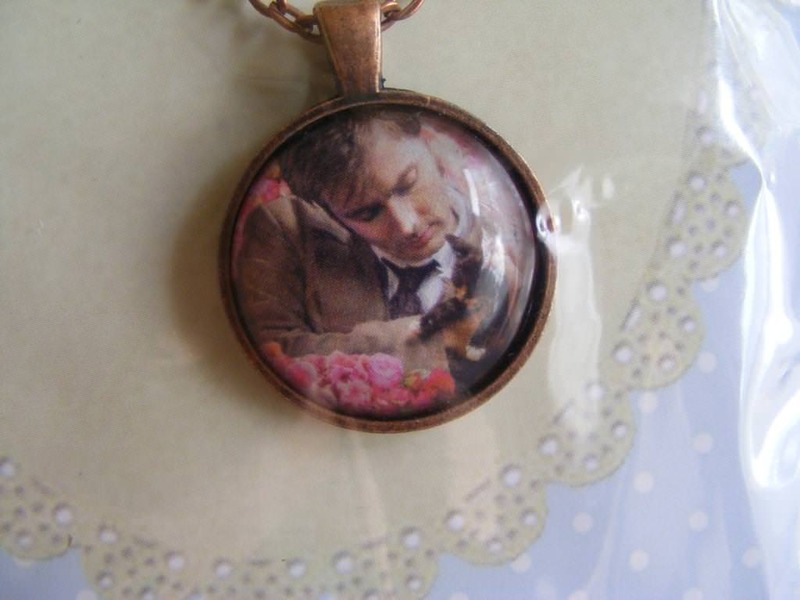 This cutie-patootie necklace was a gift from my friend Nina, who runs Le Fancy Geek Boutique. She and I have often bonded over our love of Dr Who, and she knows that David Tennant is my favourite Doctor of all time. The fact that he’s snuggling a kitten is a fabulous bonus! This pixel Totoro brooch was a gift from my friend Luke. He introduced me to the Studio Ghibli films last year, and we’ve been slowly working our way through them. This sweet little guy spent last winter hanging out on the collar of my favourite coat. Christopher Walken is one of my favourite entertainers. I like the fact that he’s an amazing actor, but he doesn’t take himself too seriously. He’ll appear in blockbuster hits like Pulp Fiction as well as smaller budget films like Wayne’s World 2 and Click. He’s an incredible dancer and whenever I see him interviewed he always gives the impression that he’s a really cool guy. 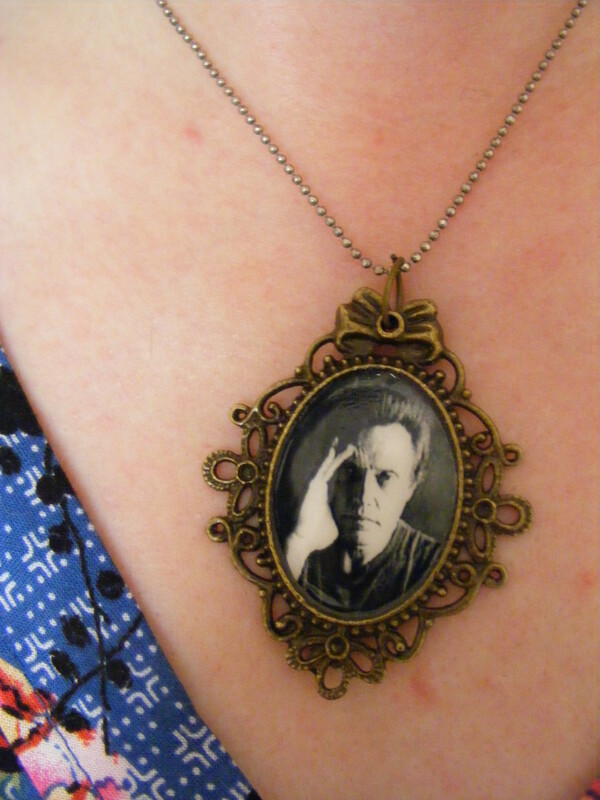 I like wearing my love of Walken on a fabulous cameo pendant. I find it nearly impossible to nominate a favourite film, but if I had to pick one it would be The Wizard of Oz. This story of friendship and looking within to find your strength has inspired me since I was a child. When I saw these sequinned heels in a shop window on my way home one day, I just had to snap them up. 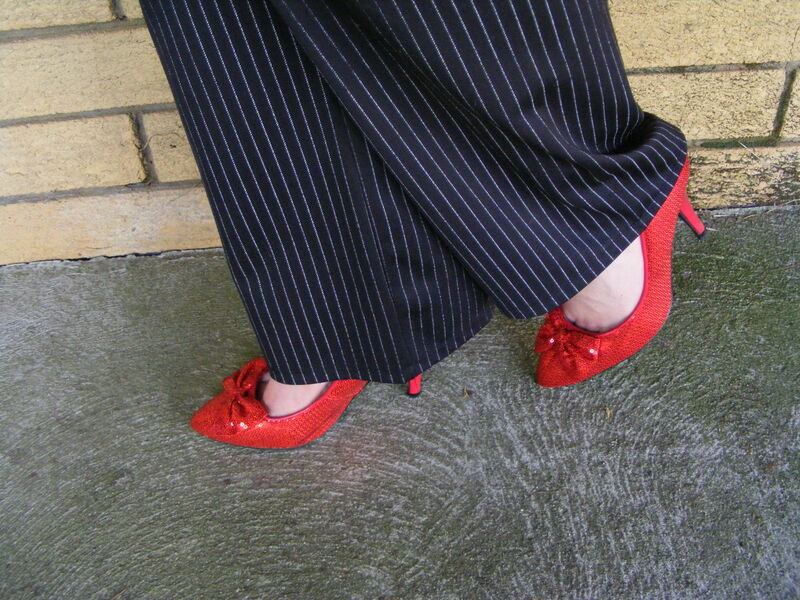 They instantly reminded me of Dorothy’s ruby slippers from the film. I now wear them whenever I need to put a little spring in my step. I have quite a few Harry Potter scarves in my collection now, but this classic first-year Gryffindor scarf is my favourite of all. It’s the most recognisable of all the Harry Potter scarves, and I’ve worn it to see each of the films. I also wore this on the cold July morning when I waited in front of the campus bookstore for my copy of Harry Potter and the Deathly Hallows. I made it myself and I always enjoy wearing it. If you’d like one of your own, they are available in the made-to-order section of my etsy store. Fandom accessories are a great way to add a touch of personality to your outfits. I have struck up many a brilliant conversation with someone about an amazing fandom shirt or accessory, and such items can provide a catalyst for friendships. Do you have any favourite fandom accessories? Leave a comment or send me a link to your own 5 Fandom Friday post. Next Practicing yoga on a budget. Aww! I’m so honored that you included my Doctor Who necklace in this post 😀 BTW – totally diggin’ that Christopher Walken necklace!! How could I not include it, it’s so awesome! The Christopher Walken necklace is super cool and I love wearing it with some of my punkier outfits.